We have the best group of grandparents at the North Branch Reformed Church Preschool! 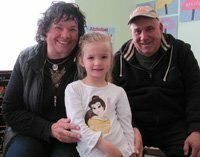 This week is “Grandparent’s Week” and our Preschoolers invited their grandparents to join them for the first hour of classes. If you were at the Preschool this week, you may have seen a grandpa lying down on the floor as he helped to build a block castle, a grandma who helped to host a tea party in the housekeeping center, a grandma rolling playdough caterpillars, and a grandpa reading a story to a group of very interested preschoolers. Best of all, we saw lots of hugs, kisses, and smiles! Thanks for visiting us grandmas and grandpas!